Please meet Dan Verner my guest on the Infinite Possibilities Blog Tour. Dan is the Vice-President of Write by the Rails, our local writing group, and many of us often seek his literary expertise, which he shares quite humbly and generously. Please enjoy his kind, witty humor! I know a lot of people who like to camp, but it’s something I’ve never done much of. I suppose I’m too addicted to creature comforts to schlep a bunch of equipment over miles of rocky trails and endure extremes of hot and cold, insects, badly cooked food, and creatures of all sorts just waiting to either devour me or poison me with lethal venom. And then there are snakes. Like Indiana Jones, I hate snakes. I know, snakes don’t hate anyone, they’re just being snakes, but they can do that somewhere far, far away from me. So, I have no tales of surviving for weeks in the wilderness with just a piece of flint and a Swiss Army knife. The only time I actually went camping (I’m not counting sleeping out in the back yard and being eaten up by mosquitoes and being able to run in the house to use the bathroom or grab a snack) came when I was ten years old and our long-suffering Sunday School teacher, a saint named Andy Eure (who had the coolest first name, Werdna, which if you’ll notice, is “Andrew” spelled backwards. His mother did and didn’t want to name him Andrew so that was the compromise she came up with. Huh. Andy was a high-powered lawyer who worked in D. C. but then taught a gaggle of squirrely boys every Sunday. 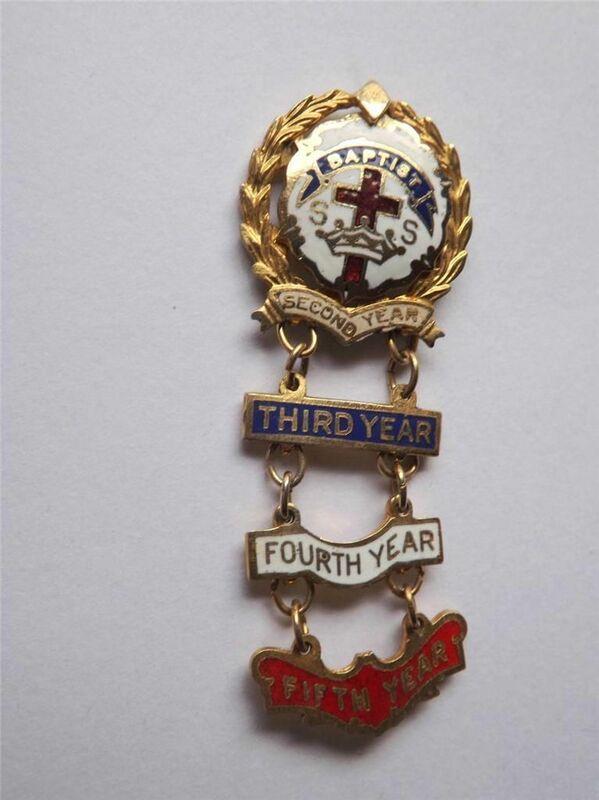 His camping trips were legendary, coming near the end of the Sunday School year when we would all be promoted to the next grade and if our attendance was exemplary, earn another bar to wear on our official Broadman Sunday School attendance pins. These little items were made of solid gold, and I’ve seen them offered for sale recently for about $600. Wish I still had mine, because if I did, I wouldn’t. We planned every second of our overnight for a month. Since I lacked camping gear and my parents were not going to buy me anything as frivolous as a sleeping bag since I had a perfectly good bed to sleep in (and which as I pointed out, would be darned difficult to carry through the trackless woods. ), I had to beg, borrow and improvise what I was going to use. A friend was in the Scouts and loaned me his Yucca pack. We amused ourselves by laughing at the word “Yucca” for hours. It just sounds funny, I think you’ll agree. Of course, I had no idea how to cook anything, so my mom came up with food that wouldn’t spoil that I could eat cold or use the campfire to heat foil packets that she assembled. I don’t remember specifically what I took, except it was heavy on potted meat, Spam and soda crackers. At that, I was better off than Frank, who always tried to be cool but never quite succeeded. He got hold of some war surplus C rations left over from World War II and discovered they were practically inedible. He offered to trade his entire supply for one ham sandwich. No one took him up on his offer. I gathered my “equipment” and my dad drove me to the church where Andy had his big Ford station wagon ready to swallow our gear. And we were off to some place with a lake, where we set up camp (my “sleeping bag” made from a couple of blankets safety pinned together) and then tore around the woods trying to destroy as much of the ecosystem as we could. None of the kids slept at all that night. Our long-suffering adult chaperones eventually retreated to their cars to get away from our Lord of the Flies reenactment. The sun rose on a bunch of exhausted ten-year-olds. We packed up, went home and fell into bed. And that was my one and only camping trip. Andy Eure never took a group of boys camping again. There are, after all, limits to the patience of a saint. 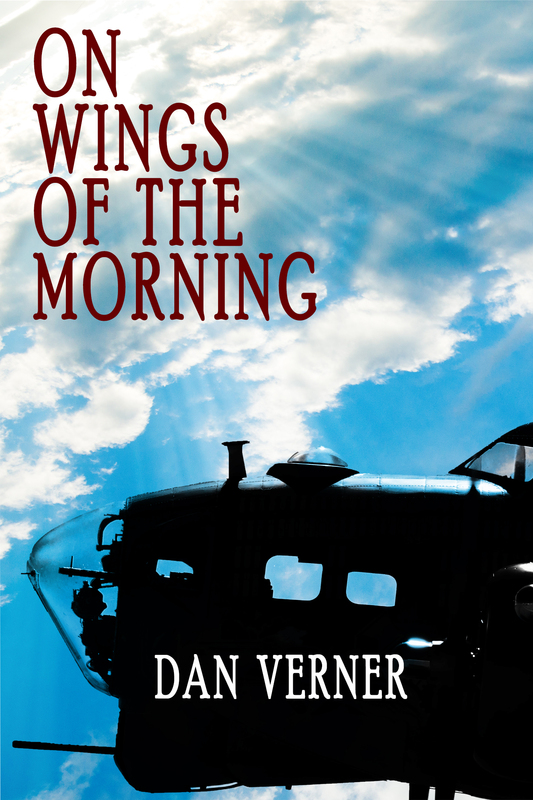 I’m Dan Verner, author of On Wings of the Morning, a novel about a Wisconsin boy who becomes a bomber pilot in World War II. 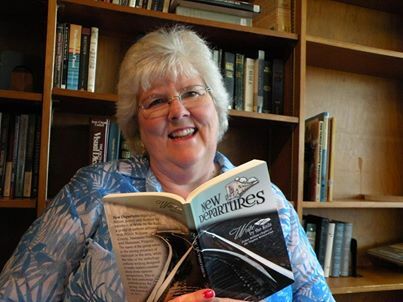 A retired high school English and creative writing teacher and a writing, human relations and computer skills teacher for adults, I’ve scored essays for the College Board, contributed columns and articles to local papers, and managed Free Lance Writing, my writing, editing, and consulting business. I’ve also authored over 1000 short essays and devotionals on a variety of subjects, and maintains three blogs. The sequel toWings, On the Wings of Eagles, will be released May 26. Jan Rayl is my next guest blogger. She is well-traveled, an entrancing story-teller, spent her childhood in Africa, and her Word Press blog is full of advice and insight. She is also a home IV nurse and has been a summer camp nurse. I suppose, from that, you can guess what we talk about when we’re together! Here’s Jan…..
Jan is holding New Departures, Write by the Rails Anthology, featuring her work. Thanks Nancy for inviting me to stop by your blog. Nancy and I share a love of summer camp. I worked for many years at summer camps – I also attended my share of them. Reading Nancy’s Book, Memory Lake took me right back to camp. It is a great read for a vacation or to warm you up with thoughts of summer this cold winter. Nancy is a gifted story-teller and she weaves the memories from summers gone by with the present day reunion she is attending. The story is one of friendship and the adventure of summer. There are some summer camp antics that will make you laugh for sure. Nancy draws the reader into the action around campfire, swimming in the lake and pranking the camp counselor.If you ever attended or worked at summer camp this book will take you back to the friendship made in those endless days of summer. You will experience the freedom and the fear of lessons learned at summer camp. If you have never worked at or been to summer camp once you have read this book you will feel like you have. I, Jan, am an avid traveler. I blog on travel and do book reviews as well. I see books as an integral part of travel. I never leave for vacation, business trip or visiting family without a good book to read. Nancy Kyme’s Book, Memory Lake; The Forever Friendships of Summer, is a great book to take along on a trip. It is an easy read, uplifting and thoroughly enjoyable read. Jan is a travel and book review blogger. Jan is also a multi-media artist. Other fascinating travel facts, recommendations, adventures and reviews of the ever important vacation book can be found on Jan’s Blog at http://write4jan.wordpress.com/ or on Facebook at https://www.facebook.com/write4jan drop by and leave her a comment. On my blog, “Keep Calm and Write On”, I write weekly “What Caught My Senses” posts, book reviews, guest authors and events, writing tips, etc. Tee Morris is my first guest post on the ‘Endless Possibilities Blog Tour.” He is an exciting ‘steampunk’ writer and a whiz at promotion. may (or may not) appear. But even with such intimate knowledge — can you pitch your book? Now when I say “Pitch your book… “ I do not mean “throw your book across a room at someone” because there are plenty of books that readers have been so motivated to do with anyway. When I say “Pitch your book… “ I mean to sell me your book within a minute. To anyone. An agent. An editor. A potential customer. You have roughly one minute on meeting any of the aforementioned to convince them that your book is the one they want to read; and I have watched with abject terror as authors blunder through five-to-ten minutes describing their books to potential readers, finishing their dissertation to a lackluster “That sounds interesting…” and then having the agent/editor/customer wander off. clean, keep it concise, and keep it within one sentence. Yes — ONE sentence. 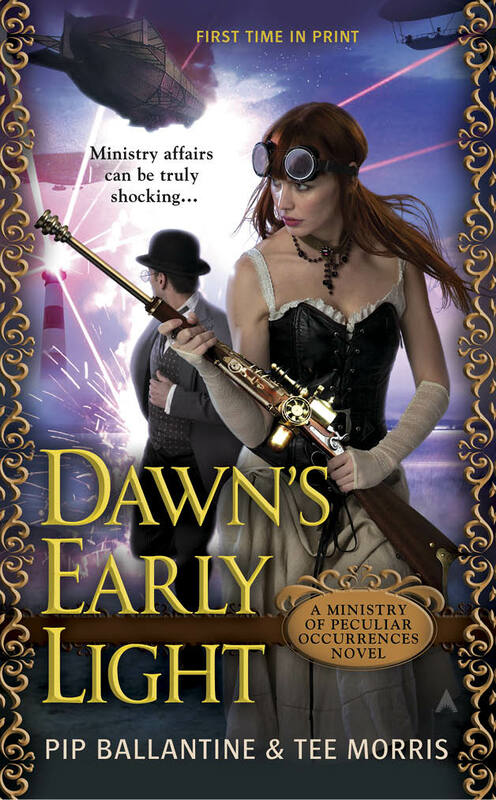 the people are on the cover and what shenanigans ensue within the pages. people know what’s in store. but to represent the book. It is your job to sum it up and make the sale. So here’s the question — can you pitch a novel? childhood friend prevents his best friend from joining a gang.” — A.B. Westrick’s Brotherhood. (She used this pitch to sell her book to an agent. Sell it to me. 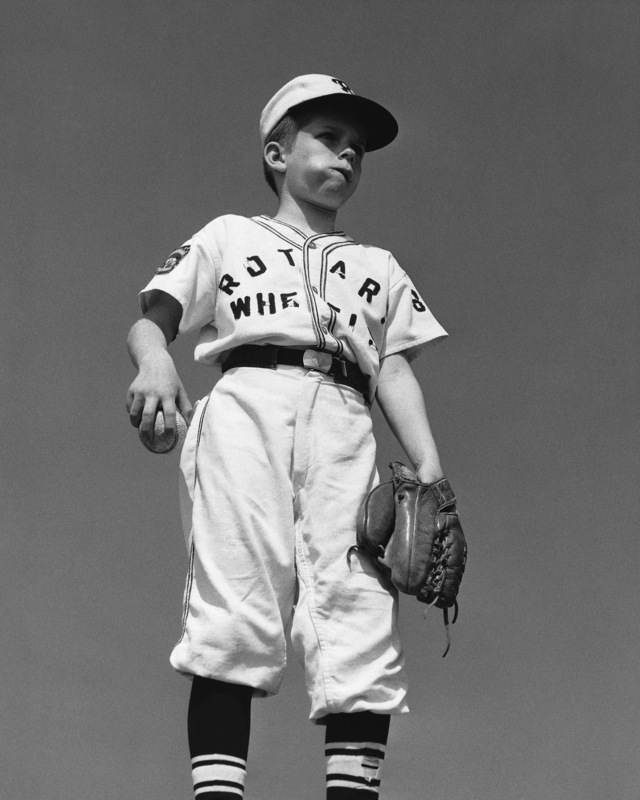 What’s your best pitch? more time to write at night…) would pave a way for his writings. enjoys life in Virginia alongside Pip, his daughter, and three cats.